The Public Library of Science (PLoS) is a non-profit open access publisher of scientific research with the mission to accelerate progress in science and medicine. Each PLoS article is free to read and is available through a Creative Commons license, optimizing the ability for researchers to build upon the work. Since its founding in 2000, PLoS journals have risen to the top of their fields and has help revolutionize the ways in which scientists communicate their work. In the spirit of PLoS, the Open Library of Humanities (OLH) will bring sustainable open access publishing to the humanities. 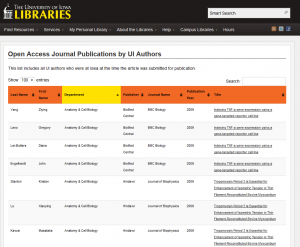 The Open Access movement is partly a response to the rising costs of the traditional publishing system, but it is mostly an effort to bring scholarly communication into the age of the web. No longer bound by the timetables and infrastructure necessary for a print-based publishing system, the OLH will offer rigorous peer-review and publish each work online when it is ready and offer article-level metrics to track each work’s impact in the scholarly field. The OLH is still in the early stages of planning but is expected to fill a much needed gap in open access options for humanities scholars. To get involved, you can subscribe to their email newsletter or contact Chris Diaz to receive updates as the project develops. Right now, the OLH is recruiting editors and is asking interested authors to Pledge to Publish in the OLH’s first year.